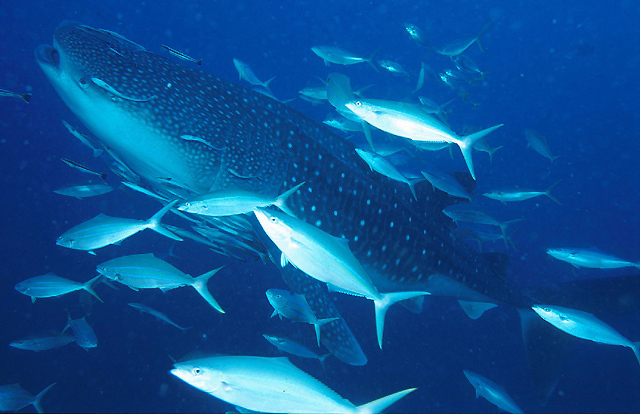 Hin Muang Dive Site Information – Hin Muang is situated seventy miles south east of Phuket and is many local Divemaster’s and instructors favorite dive site. On its day, it is quite simply unbeatable, breath taking in fact. The south side is a vertical drop off, impressively deep and the east side is more gradual slope. The first pinnacle lies approximately 8 meters from the surface and drops down to 70 meters. Many divers have seen their first Manta Ray and or Whale Shark here, as these magnificent creatures are attracted by the deep drop-offs and plankton rich waters. There is an abundance of soft corals, reds and particularly purples and this is where Hin Muang gets it name: Purple Rock in English, a beautiful site to see. The main feature, being the two large pinnacles you will find yourself diving in a figure of 8 as you admire the wonders around. Again, this is a large dive site, over 200 meters in length and it’s very deep too, easy to go deeper than you planned for, so monitoring air and depth frequently is recommended. Hin Muang is a completely submerged ridge, it is connected to Hin Deang, but it would take a foolhardy diver who would attempt this 500 meter swim, at over 70 meters depth, without a fully operational nuclear submarine. Again, here as on its sister site, there is loads of predatory action here, huge Rainbow Runners hunting beside Giant Trevally. The attacks on the small bait fish can be relentless. Other fish life in the area: Schools of Squid, Large Red Octopus scampering across the reefs, Black Fin Barracuda and Yellow Tail barracuda too. The amount of macro life here will have the photographer drooling, Pipefish, Blennies, Gobies all hiding among the small cracks and crevices of the rock. Searching around the huge Gorgonian Sea fans will also yield a fantastic wealth of macro life. The only downside to this site is there is never enough time to see it all, so at least two dives are needed here. As the minimum depth is 8 meters, it is quite a deep site to tackle and the currents can be strong creating excellent drift diving.